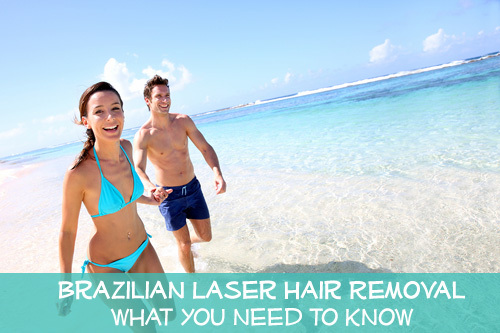 The Brazilian Hair Removal is one of the most commonly requested hair removal procedures in both men and women today. This technique essentially involves the removal of hair in the entire pubic region resulting in silky, smooth skin from front to back. In addition, this procedure delivers a fresh and clean feeling in and around the nether regions enabling men and women to move freely as well. Another reason for the popularity of the Brazilian Hair Removal method is that of prevailing swimwear fashion which allows for more skin exposure in both men and women. Traditionally, the Brazilian Hair Removal Method is performed with the application of wax. Despite its efficiency, this method is known to be highly painful and uncomfortable. In addition, the chances of developing ingrown hair are very likely after traditional Brazilian Hair Removal. Ingrown hair in the pubic region is not only unsightly but very unpleasant especially if the follicles become infected. The unsightly red bumps that one gets from Brazilian Hair Removal with the use of wax also increases the likelihood of red bumps that are known to cause discomfort for many days. Another drawback of traditional Brazilian Hair Removal is that desired results only last for a few weeks. Although hair growth is delayed by waxing, the hair follicles still grows immediately a few days after undergoing the waxing procedure. This is due to the fact that although the entire hair shaft is pulled off from the roots, the hair follicles remain intact allowing for hair to grow back again. The appearance of stubbles is yet drawback of Brazilian Waxing as it produces unwanted side effects namely itching and discomfort. These are unbearable sensations are very difficult to bear with especially when in public. 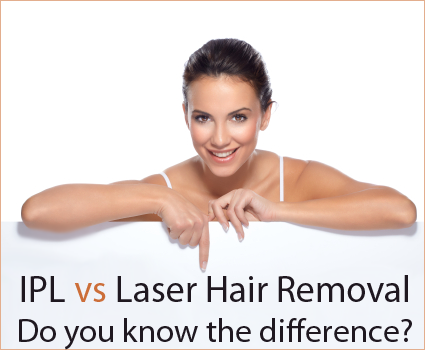 The modern approach to Brazilian Hair Removal utilizes the power of laser technology. There are several advantages of subscribing to this method one of which is permanence of results. Those who undergo Brazilian Laser Hair Removal will only need one 6-8 treatments package to achieve permanent hair loss and two maintenance procedures per year to keep the nether regions smooth, silky, and clean. Another benefit of modern Brazilian Hair Removal is that the entire procedure only takes about 10 minutes to complete. The entire pubic region is treated within minutes, thus saving you time that you can use for other worthwhile activities. The modern approach is so fast that you can even have Brazilian Hair Removal done during lunch break. Depending on your skin color and hair type, interested clients may need two or more sessions to achieve permanent hair loss results. Although this is the case, the outcome is worth the time and money as you will never have to worry about managing bushy hair ever again or have to endure the pain that goes with traditional hair removal methods in and around your pubic region. The development of ingrown hair is nonexistent with Brazilian Laser Hair Removal. Laser technology facilitates the total destruction of the hair follicles which effectively ceases the hair growth production altogether. Those ugly, painful red bumps will not be a thing of the past if you make the right decision of opting for a Brazilian Laser Hair Removal procedure instead. In addition to destroying hair follicles, laser also manages existing ingrown hairs so your skin stays silky soft always. Lastly, the high-energy laser beams effectively kills all types of bacteria in the public area thus eliminating infection too. You may be wondering how this latest Brazilian Hair Removal procedure works. Well first off, laser hair removal is performed with application of photothermolysis in which light energy emitted by the laser is converted into heat. 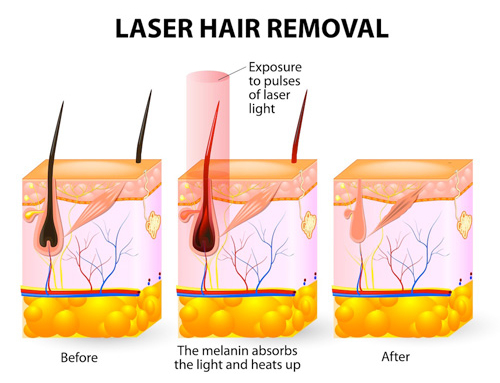 The laser beams then targets melanin found in the follicle and then heats it up quickly. 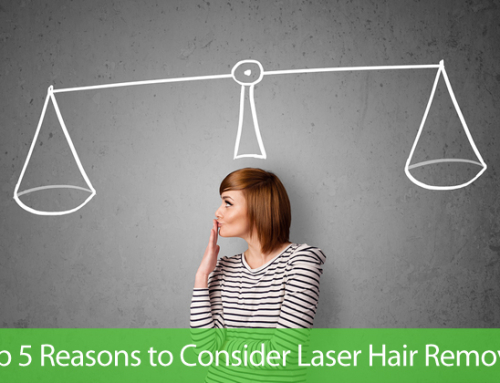 The heat from the laser beam damages the follicle making it impossible for hair to grow back again. Although you may have to take multiple sessions for permanent hair loss results, the modern approach of Brazilian Hair Removal is still relatively faster and more effective when compared alongside other permanent hair removal methods out there as laser technology allows for treatment of larger surface area per session. 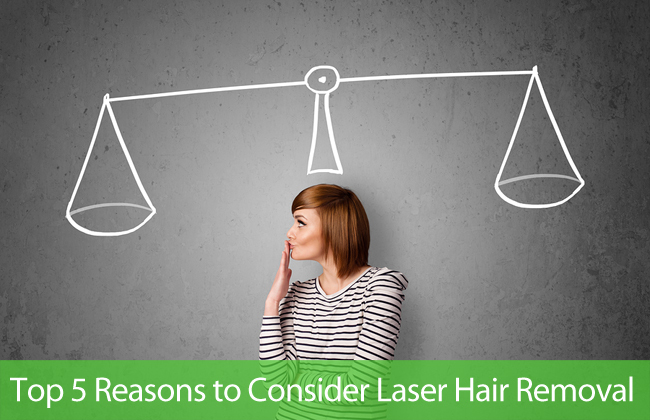 In terms of pricing, laser hair removal is more cost effective than other hair removal methods. Sure, you will need to spend a bit more money per session, but hair waxing is still more expensive if you consider that you will need to undergo this procedure for many years to come. Brazilian Hair removal with the use of laser technology is one of the most powerful and most effective means to keep a health, silky, and smooth skin not only during summer but all-year round. The laser hair removal procedure being offered by Gentle Touch Laser Centers is the best there is! As promised, Laser by Gentle Touch Laser Centers will give you the opportunity to get rid of unwanted hair growth for a more confident you! Now is the time for a silky, smooth skin. Book an appointment now at Gentle Touch Laser Centers and start enjoying a healthy, hair-free body today!